We released a new version of ProtoSphere today, updated with six new features for improving productivity and supporting compliance training. 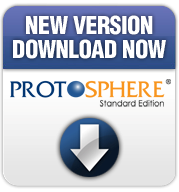 Grab the new ProtoSphere 1.5.2 demo and give it a spin. Here's a wrap-up of what's new in ProtoSphere. ProtoSphere streaming portable app version lets you quickly download and launch ProtoSphere from a browser plug-in and begin working within minutes. No installation and admin rights needed. The laser pointer enables you to direct users' attention to content and objects. Drawing tools let you easily put annotations directly on Presentation Boards. Fifteen newly designed zones support the range of meetings, conferences, and events your company holds with better content visibility and ability to quickly see who's in your meeting at a glance. Updated moderator controls for Presentation Boards, including the ability to lock out users from interacting with surfaces during a meeting. Integration with Kaplan EduNeering's ComplianceWire learning management system lets you launch compliance training sessions in ProtoSphere from ComplianceWire. We've shown you some of these features already on our blog. The team and I are also working on putting together posts that take you through the other ones in more detail. More to come soon! In the meantime, feel free to explore ProtoSphere 1.5.2 and let us know what you think.